Generates star shaped glints at locations where the Source clip is brighter than the threshold. The colors of the glints are scaled by a Mask input, and then combined with the Back input clip. 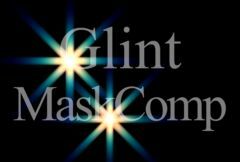 This is similar to Glint, but here a Mask input is provided, and also the glint source and background can be different clips. Size Red: Default: 1, Range: 0 or greater. Size Green: Default: 2, Range: 0 or greater. Size Blue: Default: 3, Range: 0 or greater.